Carrie came over this week for dinner and we enjoyed this crab soup with a spinach salad and plenty of wine. The cilantro relish was a big hit, and though crab is expensive, it was totally worth it in this dish. We all loved it! The recipe comes from The Ultimate Soup Bible . I think there’s probably a bit too many noodles, but other than that I’m in love with this soup! Too many noodles in the recipe? Nah, the recipe itself is probably a good amount, but my estimating skills are lacking. Determining five ounces out of a package of 16 when some unknown portion of them have already been used apparently is a challenge for me. The cilantro topping is awesome. Yes! Let’s finish the batch! Heat the oil in a large dutch oven and add the onion, chilies, and garlic. Cook over medium-low heat for 10 minutes until the onion is very soft. Transfer the cooked onion mixture to a bowl and stir in the crab meat, parsley, cilantro, and lemon juice, and set aside. Bruise the lemongrass on a chopping board. Pour the stock and fish sauce into the dutch oven. Add the lemongrass and bring to a boil, then add teh pasta. Lower the heat and simmer uncovered for 3-4 minutes until the pasta is just tender. While the soup is simmering, prepare the relish by using a mortar and pestle to make a coarse paste of the cilantro, chili, oil, lemon juice, and cumin. Remove and discard the lemongrass from the soup. Add the crab mixture into the soup and season with salt and pepper to taste. Bring to a boil, then set on low and simmer for two minutes. 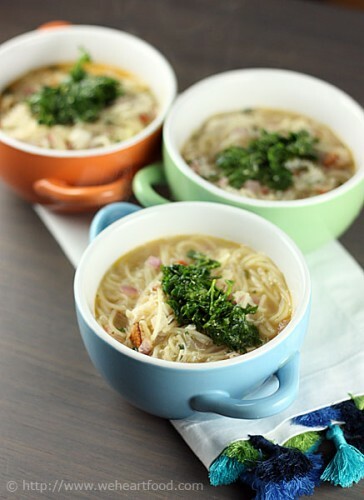 Ladle the soup into four bowls and put a spoonful of the cilantro relish in the center of each. Lisa has running group on Tuesdays, so I try to find recipes that can be prepared relatively quickly and don’t depend on exact timing — and so we can eat as soon as she walks in the door! 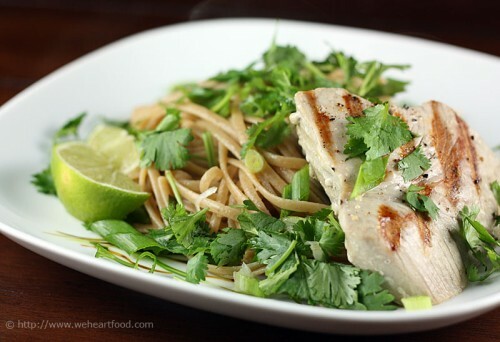 This pasta dish from Fitness Food fit the bill: tuna steaks are grilled and placed upon a bed of wheat-noodles that have been tossed with plenty of cilantro, green onions, and an asian-inspired dressing. Any recipe that includes the words “one large handful of cilantro” gets my vote! See? You go for a run, you have run-worthy food waiting for you when you get home. I love the green onions. …and of course, the cilantro? I’d totally make this again if we wanted a quick pasta-and-fish meal. It took all of 20 minutes to make. Good, because I’d totally eat it again! Mix the lime juice, fish sauce, sweet chili sauce, sugar, and oil in a small bowl with a whisk, and set aside. Pat the tuna steaks dry and season with salt and pepper. Heat a grill pan over high heat and spray with the oil. Add the tuna and cook for 2 minutes on each side, or until cooked to your liking. Transfer the steaks to a warm plate, cover, and keep warm. Meanwhile, place the noodles in a large pot of salted, rapidly boiling water and cook according to package directions, until al dente. Drain well. Add half the dressing, half the scallions, and half the cilantro, and toss well. Divide the noodles between two plates, then place a tuna steak on each. Mix the remaining dressing with the scallions and cilantro and drizzle over the tuna and noodles. Serve with the lime wedges. Our first post after our almost three weeks in Italy (w00t honeymoon!) is this chicken dish from Rick Bayless’s Mexican Everyday. The original recipe calls to prepare it in a slow-cooker, but, not owning one, we went with the oven-bake method instead. This was a perfect recipe match to our CSA box, which this week included tomatillos and red-skinned potatoes. Me too — I was taking bites while you were taking pictures. This is like your dream dinner — there’s no oil, and there’s salt between each layer. I bet the flavors would be even more intense if this was done in a slow-cooker. And I really like the little crispy edges of cilantro and tomatillo from the lid-free finish. Too bad I have lunch plans tomorrow, this would make a great lunch. Guess what we’re having for dinner tomorrow night, then? Heat the oven to 400 degrees. In a 6-qt Dutch Oven, spread the onion in a layer, and sprinkle with salt. 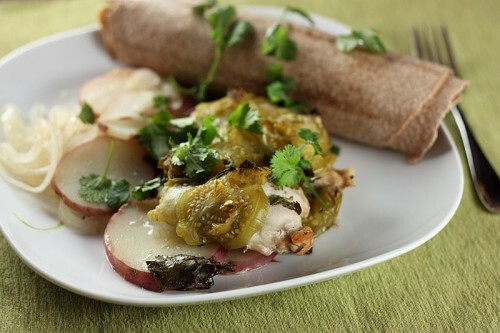 Continue with the potato slices, chicken, cilantro, and tomatillos, sprinkling with salt over each layer. Scatter the roasted chilis over the top. Set the lid in place and bake for 45 minutes. Remove the lid and bake 15-20 minutes longer to reduce the juices. Spoon directly onto plates, and top with additional cilantro. Sometimes you know a recipe’s just not going to be anywhere near authentic, not going to be nearly as good as you could get in a restaurant, but could still suffice for a quick weeknight meal. This is one of those recipes, from the cookbook How to Eat Supper. 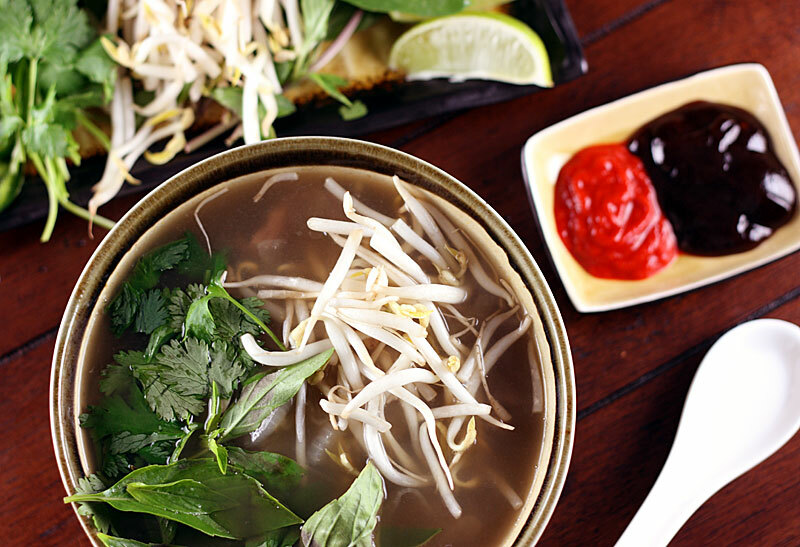 Should you really expect a full-flavored broth — the essence of pho! — in a 20 minute cooking-time recipe? No. If you haven’t yet experienced pho, this might stand on its own as an interesting soup recipe, but if you try to compare it to the real thing, it falls short. But hey — it was good enough to warm our bellies on this chilly evening. What the pho? This just makes me want real pho, not faux pho. What if you just think of it as a noodle soup with slices of beef in it? Okay — in that case, it’s not bad. But the broth could still be more flavorful. You can definitely taste the broiled veggies, and they’re good, but I really need to try to disconnect the pho association. You certainly look like you’re enjoying your sauces. Pho Shizzle. I’m a meat dipper. Oh, pho cryin’ out loud… enough with the puns! Okay, fine. In fact, there’s my review of this recipe. Okay/fine. Not spectacular, but I certainly didn’t dislike it. I agree. Good, not great. Place an oven rack 4-6 inches under the broiler and preheat. On a large piece of doubled-over foil, scatter the vegetables and spices from the broth ingredients (onion through black pepper) and broil for five minutes, flipping once, until the onion begins to char and the spices are fragrant. Remove from the oven and place everything in a large pot. Add the broth, sugar, and fish sauce and bring to a low boil. Cover, lower the heat, and simmer for 20 minutes. While the broth simmers, prepare the rice noodles by soaking them in warm water for 10-15 minutes, or until almost tender. (They’ll lose a little more firmness when the soup gets added.) Drain and divide the noodles between two very large soup bowls. Place the garnish ingredients on a plate and set at the table. When ready to serve, divide the (raw) beef between the two soup bowls. Ladle the low-boil broth into the bowls (this will cook the meat pretty much instantly). Top each bowl with your preferred garnishes. Tonight, a dish that’s perfect for those hot summer evenings where you don’t want to turn on the stove or the oven: a “stew” made entirely of raw and precooked ingredients. 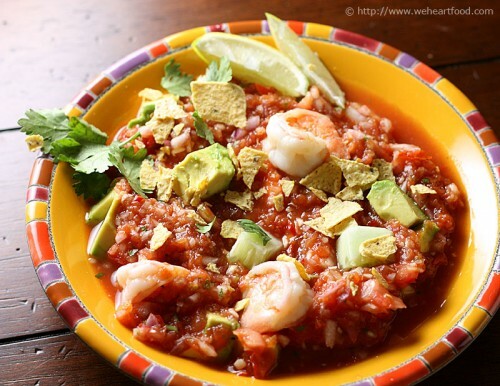 Shrimp, cucumbers, and avocado are topped with a puree of tomatoes, onions, and peppers, then topped with cilantro and tortilla chips. This recipe comes from How to Eat Supper. Is this like gazpacho or something? Sort of — it’s like the world’s best chunky salsa. Yum… seems pretty light if it’s just raw veggies and shrimp. Yep! Light and refreshing… that lime juice brightens up the flavors a bit. So, you mentioned that you don’t have to turn on the oven, but we did anyway for the bread we had with it. Yeah, well I also mentioned that it’s good for really hot nights, but it’s actually kinda cool and raining. In a small bowl, combine the lime juice, onion, garlic, jalapeño, and spices. Let marinate for 10 minutes. Place the tomatoes and cilantro sprigs into the bowl of a food processor, and pulse until the mixture is chunky. Add the onion mixture, and pulse five times. Divide the cucumber, avocado, and shrimp among four bowls. Spoon the tomato blend into the bowls. Garnish with the crushed tortilla chips, additional cilantro, and lime wedges. © 2019 We [Heart] Food. All Rights Reserved. We [Heart] Food is powered by WordPress and is using a heavily modified Silver Lexus theme.